An assortment of fiber washer variants from The Hillman Group. Flat washers are great for adding resistance to your bolts and screws to prevent them from boring into the surface material and weakening it. When selecting a washer, be sure to pick one that matches the fasteners you are already using. Variants included in this assortment range from 1/4" thru 7/8" in overall diameter. 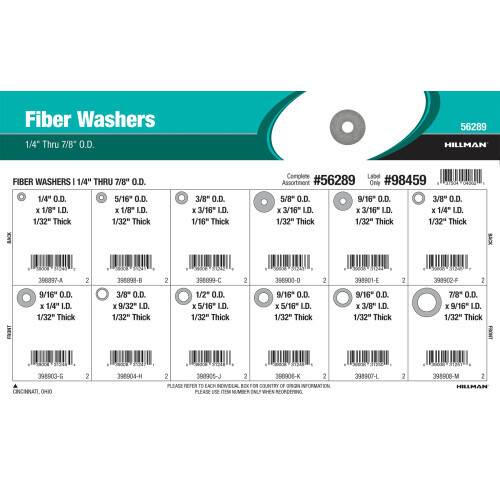 Full assortment contains twelve (12) refills comprised of Hillman item numbers #398897 - #398908.